Situated in Oklahoma City, Oklahoma, The Skirvin Hilton first opened its doors in 1911 inviting luminaries and the social elite to explore its two majestic 10-story towers and 224 luxury guestrooms. In 1930, the historic hotel's popularity inspired a third wing to be added, raising the structure to 14 stories and increasing capacity to 525 rooms. 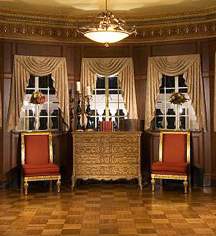 After an extensive renovation project restoring the original exterior finish, installing historically accurate windows, reconfiguring guestrooms, and adding new guest elevators, The Skirvin Hilton reopened on February 26, 2007. The historic Skirvin Hilton hotel features an elegant lobby, the signature restaurant Park Avenue Grill, and The Red Piano lounge located just off the lobby beckoning visitors to relax and enjoy the comfortable and stylish setting of the grand destination. Just a short walk to the Cox Business Services Convention Center, The new Skirvin Hilton hotel is the ideal location to meet and celebrate and includes 15,000 square feet of meeting and pre-function space. Meeting rooms incorporate state-of-the-art technology, including high-speed internet throughout. True to the legacy of its founder, W. B. Skirvin, the historic Oklahoma hotel once again stands as a proud testament to the history – and future – of Oklahoma City. 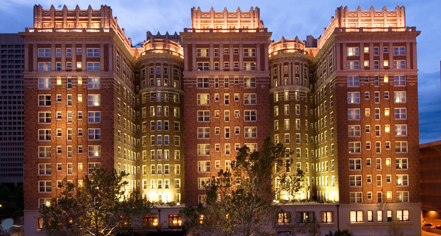 Situated in Oklahoma City, Oklahoma, The Skirvin Hilton first opened its doors in 1911 inviting luminaries and the social elite to explore its two majestic 10-story towers and 224 luxury guestrooms.